For the third month in a row, equity CEFs and fixed income CEFs on average witnessed plus-side returns, rising 1.65% and 1.39%, respectively, on a NAV basis for March. Only 16% of all CEFs traded at a premium to their NAV, with 18% of equity CEFs and 15% of fixed income CEFs trading in premium territory. Energy MLP CEFs (+4.74%) posted the strongest returns of all equity CEF classifications for the month. The California Municipal Debt CEFs classification (+2.62%) posted the strongest plus-side returns in the fixed income universe for the month. For the fifth month in a row, the municipal debt CEFs macro-group posted a plus-side return on average (+2.31%), with all classifications in the group witnessing positive returns for March. Photo Source: REUTERS/Brendan McDermid. 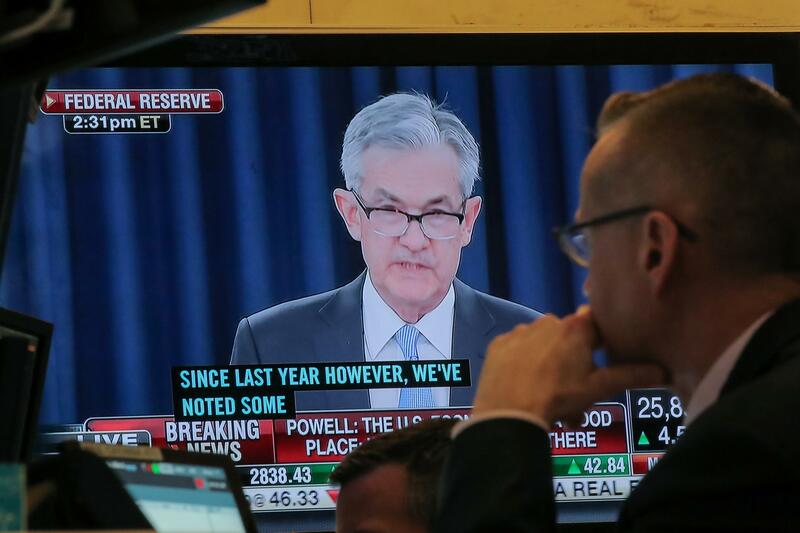 A trader watches U.S. Federal Reserve Chairman Jerome Powell on a screen during a news conference following the two-day Federal Open Market Committee (FOMC) policy meeting, on the floor at the New York Stock Exchange (NYSE) in New York, U.S., March 20, 2019. For the month, 87% of all closed-end funds (NYSE:CEFS) posted net-asset-value (NYSE:NAV)-based returns in the black, with 89% of equity CEFs and 85% of fixed income CEFs chalking up returns in the plus column. For the second month in three, Lipper’s domestic equity CEFs macro-group (+2.03%) outpaced its two equity-based brethren: mixed-asset CEFs (+1.07%) and world equity CEFs (+1.04%). For the second month in three, the Energy MLP CEFs classification (+4.74%) outperformed all other equity classifications, followed by Natural Resources CEFs (+2.93%) and Utility CEFs (+2.66%). For the first month in three, municipal bond CEFs jumped to the top of the leaderboard, posting a plus-side return on average (+2.31%), followed by taxable fixed income CEFs (+0.70%) and world income CEFs (+0.34%). All but one of the domestic taxable fixed income CEF classifications posted plus-side returns for the month, with Corporate Debt BBB-Rated CEFs (+2.12%, February’s relative laggard), Corporate Debt BBB-Rated CEFs (Leveraged) (+1.85%), and U.S. Mortgage CEFs (+1.18%) posting the strongest returns of the group. For March, the median discount of all CEFs widened 14 bps to 7.86%—still narrower than the 12-month moving average median discount (8.53%). In this report, we highlight March 2019 CEF performance trends, premiums and discounts, and corporate actions and events.